One thing that is for certain about great wedding photography.... The best images with the most impact are candid moments. If you can capture them, you are going to be a great wedding photographer. In this particular photo, we are not looking at a real candid photo. However, in my opinion, we captured a candid MOMENT. 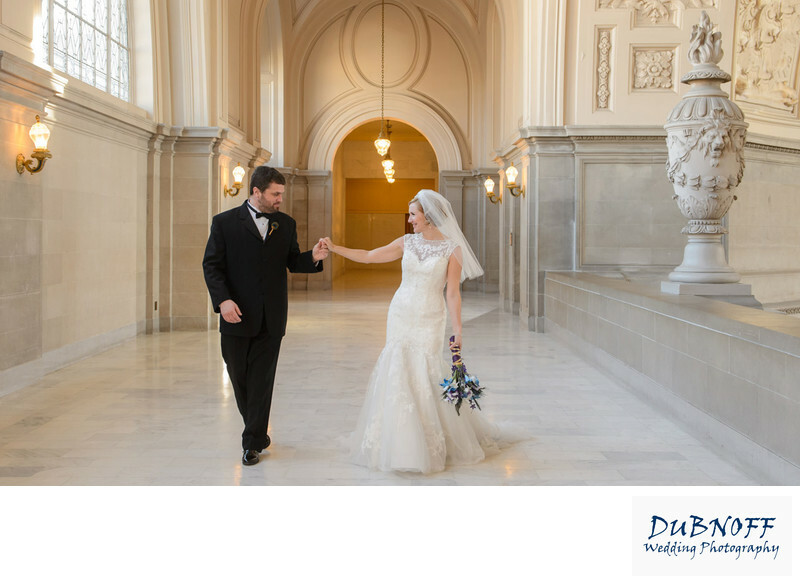 We asked the couple to walk on the 4th floor North Gallery at San Francisco City Hall. As they walked towards us, they started being playful with each other and I captured the photo above. A very nice moment between this newly married couple. When we photograph weddings, we try to not pose every single photo. Instead, we try to put the couple into situations such as the above photo illustrates. We spent considerable time with the bride and groom also creating posed photographs, but this is one of our favorites!